Creating Keepsakes has another great special issue hitting the shelves that you won't want to miss! Scrapbooking Holidays & Celebrations would make a great holiday gift for the scrapbooker in your life...or get yourself an early gift! You'll be set with inspiration to keep you scrapping all through the coming year. 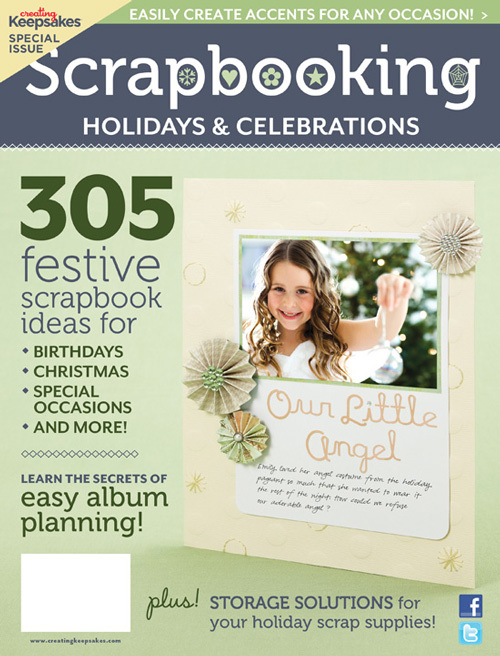 Whether your holidays and celebrations are casual get-together or formal events, this special issue from Creating Keepsakes magazine is sure to be a trusted source of scrapbooking inspiration! The gallery of 50 outstanding ideas is a quick source of scrapliftable layouts, and you'll also discover ways to make your relationships shine on your scrapbook pages, photo-taking tips to catch meaningful moments and details of your celebrations, and journaling ideas to capture the points of view of your loved ones. Learn ways to create easy holiday accents and even ideas for storing your holiday-themed supplies. Pick up this issue today for non-stop scrapbooking inspiration for all your celebrations during the upcoming year! 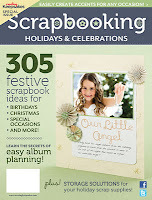 Here's your chance to win a free copy of Scrapbooking Holidays & Celebrations for yourself! Simply leave a comment to this post by 5 p.m. CST on Thursday, November 17, 2011.